In a series of pictures, Cyrus, donning an elegant white gown, can be seen lovingly hugging Hemsworth, who looks handsome in a black-and-white suit. It’s confirmed! 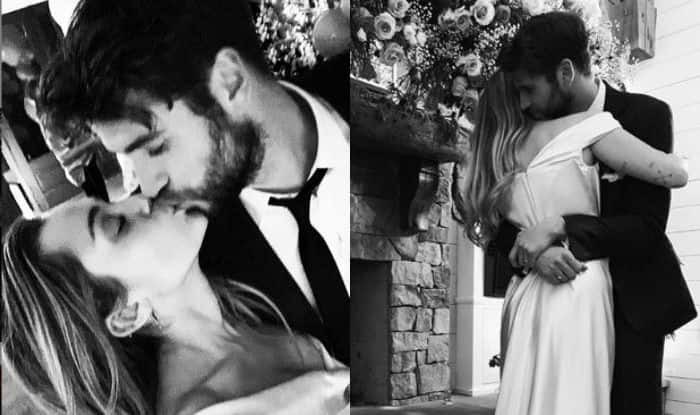 Liam Hemsworth and Miley Cyrus are now man and wife. The 26-year-old took to social media to confirm she has tied the knot with her long-time boyfriend. In a series of pictures, Cyrus, donning an elegant white gown, can be seen lovingly hugging Hemsworth, who looks handsome in a black-and-white suit. Speculation began to mount on Sunday after photos and videos from the intimate ceremony surfaced on social media. In one of the videos, the ‘Isn’t It Romantic’ actor and his brothers Chris and Luke Hemsworth could be seen doing shots with Mr. and Mrs. balloons in the background. Another photo showed the newlyweds in front of cake and cupcakes, with the singer’s mom Tish in the frame. The couple first met on the sets of the movie ‘The Last Song’ in 2008. After dating off and on for many years, Liam popped the question for a second time in 2016.